In the latter half of the nineteenth century, Michigan’s bountiful forests were instrumental in the expansion of cities such as Chicago, Detroit and Milwaukee. Manufacturers and builders needed the state’s pine, hemlock and hardwoods, and the Great Lakes provided a perfect means of transporting the coveted lumber. But lighthouses were necessary in order to guide the ships safely through what were often unpredictable waters. 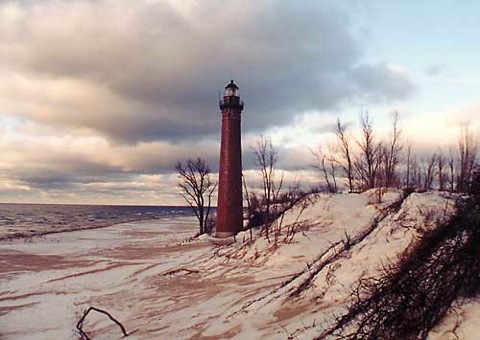 Among the most distinctive of the lighthouses built to meet this demand was Little Sable Point Light Station. One of the regions along the western shore of Lake Michigan that needed a lighthouse was south of Pentwater. In the late 1860s, local businessman Summers Fox began to petition for a light station to be built. Demand for a lighthouse grew after the schooner Pride was lost when it ran aground at a place known as Petite Pointe Au Sable in 1871. Orlando M. Poe, the Major of Engineers of the 11th Lighthouse District, wrote to the Lighthouse Board in 1872 requesting that land be set aside for a light station. That same year Congress appropriated the necessary money for the project. Thirty-nine acres were purchased, but construction of the lighthouse would not be easy since no roads existed over which to bring supplies to the remote coastal location. All materials and men would have to be transported via the lake. Designed by Orlando Poe, the lighthouse tower walls were to be five feet thick at its base, and two feet thick at its highest point. Construction began in April 1873, with the first order of business being to build a dock to accommodate boats carrying supplies. The following year, a prefabricated cast iron lantern room and gallery along with 139 cast iron steps were installed in the 107-foot tower. The crowning touch was the installation of a Third Order Fresnel lens. The original lens remains in use today; it is one of only seventy original Third Order Fresnel lens still in operation in the nation. Little Sable’s rare Third Order Fresnel lens emits a constant white light that can be seen for 19 miles out onto Lake Michigan. Three wicks produced illumination for the first light, but an incandescent oil vapor lamp – which also used kerosene – replaced the wicks in 1918. In addition, a clockwork mechanism regulated a five-second flash every 30 seconds. Connected to the tower via an enclosed walkway was a one-and-a-half story brick house for future lighthouse keepers and their families. Like the lighthouse tower, it too was built of especially durable brick. Initially both tower and house were left unpainted. It was thought that the structures would better withstand the harsh elements without paint deteriorating and peeling off. And since the lighthouse keeper was responsible for painting the tower every year, this was no doubt a popular decision with the Little Sable’s first keeper James Davenport. This policy was changed in 1900 when the tower was painted white due to numerous complaints from ship crews who had difficulty seeing the natural brick of the lighthouse during the day. The annual coat of whitewash remained until 1975 when a decision was made to sandblast it to its natural – and original – color. At the close of construction season 1873, the lighthouse was complete and Keeper James Davenport arrived to maintain the station that winter. His Assistant Keeper J. Larkey joined him in April 1874 at which time they first exhibited the light for the beginning of that year’s shipping season. 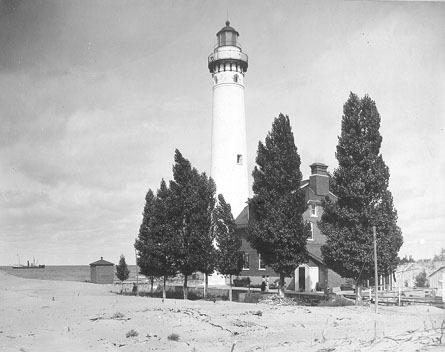 The lighthouse was officially known as ‘Petite Pointe Au Sable’, but this was changed to Little Sable Point Light in 1910. A 1952 article in the Sunday Magazine of the Grand Rapids Herald contains an interview with then Lighthouse Keeper Vavrina and his family at Little Sable Point. They describe what it was like to live in such a remote location with no running water or electricity, and surrounded by the waves of Lake Michigan, the sand dunes and giant junipers. The family provided for themselves by keeping chickens, as well as hunting deer and small game in the surrounding woodlands. Although it was 1952, heat was provided by a coal stove in the living room, and water by a hand pump in the kitchen. The article also elaborates on the daily routine of a lighthouse keeper. “The lens is meticulously polished by Vavrina and his assistant, as are the glass prisms.” Duties were split between the two men, usually on a 24-hour on, 24-hour off schedule. The keeper who was on watch walked to the top of the tower three times in one day. The first time he lit the lamp and wound the clockwork mechanism before sunset. The second time he went up to wind it again at midnight. And finally, the keeper climbed those 139 steps at dawn to extinguish the light. Each time, a keeper carried with him containers of kerosene holding 2-3 gallons. Just two years after this article appeared, an underground electric line was finally connected to the station, automating the light. Eighty years of manually keeping the light at Little Point Sable came to an end. Keeper Vavrina was transferred to Big Sable Point Lighthouse just north of Ludington. Unfortunately the brick structures attached to the lighthouse tower at Little Point Sable were razed to the ground. During its 80 years of operation, fifteen keepers were stationed at Little Point Sable; one was a woman who kept the light for a month when the keeper went on leave. 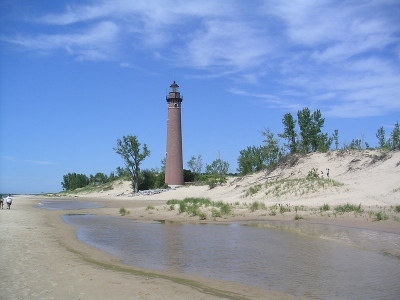 Little Sable Point’s thirty-nine acres are currently part of Silver Lake State Park. 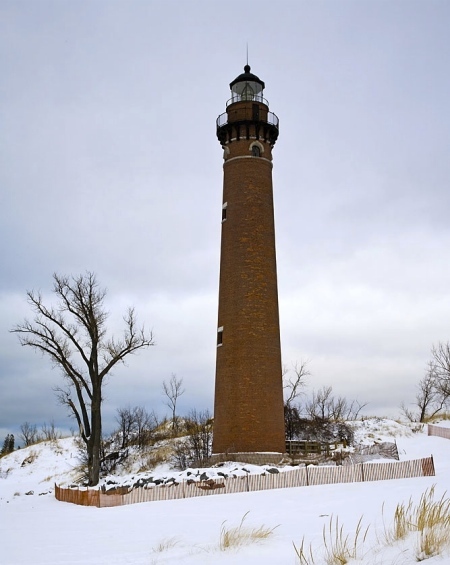 The lighthouse, one of the oldest brick towers remaining on the Great Lakes, is located two miles from Silver Lake. In June 2006, the lighthouse was opened to the public. Visitors can now climb those cast iron steps just as the lighthouse keepers did and get a close up look at that rare Third Order Fresnel lens as well as marveling at the magnificent view of the lake that Little Point Sable spent the better part of a century guarding.